EXTREME weather conditions over the past few weeks have destroyed crops in several states, triggering farmers’ suicides. In all, over 300 farmers reportedly killed themselves in Andhra Pradesh (275), Odisha (36) and Madhya Pradesh (7), the worst hit states. Media reports said some of the deaths were caused by heart attacks following crop failure. 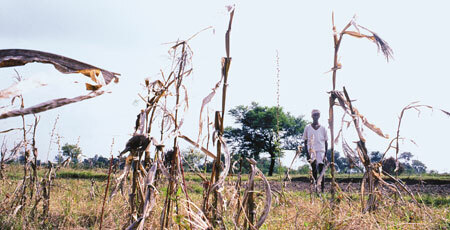 Crops in Madhya Pradesh were damaged by frost and extreme cold. 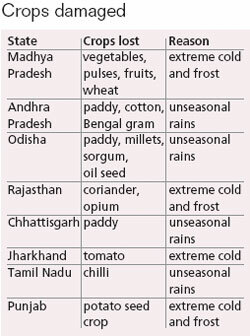 Unseasonal rains in December destroyed crops in Andhra Pradesh and Odisha. Parts of Rajasthan and Jharkhand also reported crop losses. Officials said they did not anticipate such extreme weather conditions. In Andhra Pradesh, paddy crops that were ready to be harvested were damaged by unseasonal rains in the first week of December, said Balram Nayak, additional director for agriculture. The state’s estimates say over 3 million farmers have been affected by crop damage on 1.5 million hectares (ha). Total crop loss in the state is 1.88 million tonnes. Met officials said the unseasonal rains were caused by La Nina (weather condition induced by extensive cooling of central and eastern Pacific Ocean). In Madhya Pradesh, where instances of farmers committing suicide are rare, Udai Singh, 28, said he drank pesticide when frost ruined wheat and pulses on his 6-ha farm in January first week. He survived. “I have to repay Rs 2 lakh. Death seemed the only escape,” he said. Seema Bhargava, the Madhya Pradesh revenue secretary, said crops destroyed include pulses, vegetables and fruits (see ‘Crops damaged’). She said extreme cold has also hit sowing of chana (chickpea) and wheat. She said the state would shortly send its crop damage report to the Centre. In Rajasthan, coriander cultivated in over 16,000 hectares was damaged, said J C Mohanty, state agriculture commissioner. Debjeet Sarangi of non-profit Living Farms, which works for farmers’ rights, said farmers in Odisha are perhaps the worst affected. “Our field surveys in Raigarh district showed large quantities of crops like millets and sorghum have been destroyed. As a result, farmers don’t have funds to sow crops for the rabi season,” he said. An agriculture department official said more than 50 per cent crop loss has been recorded in 1.2 million ha of cultivable land in Odisha. He added that a team from the Centre visited the state in December to assess losses. India Meteorological Department (IMD) officials said regions in the Indo- Gangetic plains were affected by extreme low temperatures between December 15 and January 20. “No doubt extreme temperatures have been witnessed. But it is not something new. We have to be prepared for it,” said Ajit Tyagi, director general of IMD. IMD has 132 agro-met advisory units that work with state agriculture universities. Tyagi said, these units send forecasts every Tuesday and Friday for the subsequent five days on the basis of which advisories are prepared. “Sending these advisories to the farmers is the responsibility of state agriculture departments and universities,” he said. But the Central and state governments are yet to roll out their plans to protect farmers from extreme weather events. Crop insurance in India is yet to pick up (see ‘New insurance lets farmers down’, Down To Earth, November 15, 2010). Farmers organisations, including Odisha Kisan Sabha and Nabanirman Krushak Sangathan, meanwhile, said farmers need loans and debt waivers. Why do farmers have to die? In a country where economy has traditionally been agriculture-based, farmers have been the biggest sufferers by way of government policies or natural calamities especially in recent years. Majority of indian farmers are small and most of them cannot be insured under existing crop insurance schemes launched by Agriculture Insurance Company of India, which is the only authority to offer crop insurance.Our crop insurance policies are practically out of the reach of more than 80% farmers and as such this insurance sector has proved to be a big failure. When government extends financial aid to farmers in cases of big calamities, most of that aid goes to financial institutes like banks. Measures taken by government to salvage the farmers are highly inadequate and misdirected , and such a big number of suicides prove them to be an absolute 'miscarriage;.